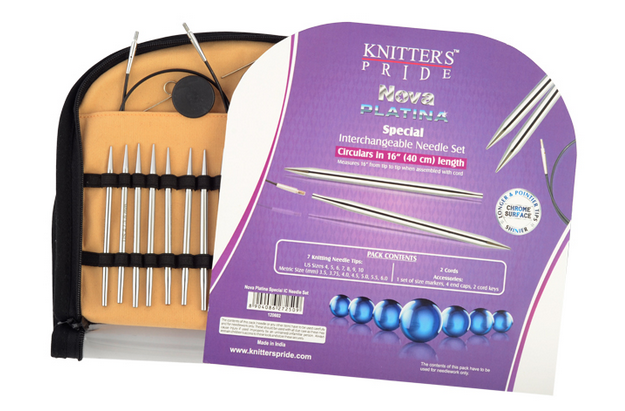 The needle tips in this special set measure 3 1/2 inches without the cord attached and are designed to produce circulars in 16'' (40cm) length. Note: Total length of 16 inches is achieved when tips and cord are joined together. - US Sizes 4, 5, 6, 7, 8, 9 and 10 / Metric Sizes 3.5, 3.75, 4, 4.5, 5, 5.5, and 6 mm. - 2 cords to make 16" (40 cm) circulars. - Packed in a black jacquard fabric case.